This book was sponsored by an Australian organisation with an early intervention literacy campaign educating parents to read to their children from birth. The Little Big Book Club was officially launched in 2005 and in the following year, 20,000 families across the state with a baby aged 0-12 months were given the first free 'reading pack for babies'. 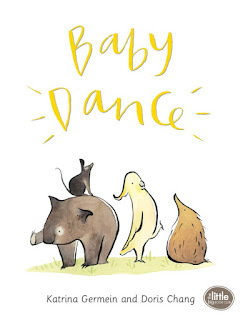 A board book with rounded corners for babies to handle safely, Baby Dance has one or two lines on each page starting with ‘Baby hears, baby beat/Baby steps, baby feet’. Its first pen and wash illustrations are of a wombat, followed by other Australian animals such as a cockatoo, anteater and marsupial mouse. Each of the actions described is something any baby does, such as yawning, peeping, waving and blinking. Thus a parent reading to his or her baby can perform the actions as the words are read aloud – a great bonding experience! Simply worded, designed and illustrated with lots of white space, this is an ideal book to share with a child from birth to two years.